Approximately one in ten Canadians will develop a kidney stone. This problem is more common in men than in women, and, it occurs rarely in children. Kidney stone formation in most adults is not thought to be an inherited condition even if several family members have had stones. Children with kidney stones, however, are more likely to have an inherited risk. Some children have severe forms of stone disease that require thorough investigation and frequent follow-up. Kidney stones form when the concentration of certain substances in the urine exceeds the amount that can be kept dissolved. This can happen when the urine becomes over-concentrated due to low urine volume or excessive excretion of a substance. Low urine output may be due to inadequate fluid intake or excessive fluid losses such as with frequent heavy perspiration or chronic diarrhea. Alternatively, the urine may be overloaded with a substance because of excessive dietary intake, excessive production by the body, or, changes in the function of the bowels or kidneys. Kidney stones are rarely a sign of other kidney disease. Most often kidney stones take many months or years to grow to a size that can produce symptoms, generally, by obstructing urine drainage from a kidney. Occasionally, stones may form more rapidly. Because stones usually do not cause symptoms soon after they are formed, it is impossible to know how rapidly a person’s stone or stones have formed. Approximately 50% of stone formers will develop a second kidney stone within 10 years of their first stone, and 75% within 20 years. Most kidney stones contain calcium, usually calcium oxalate or calcium phosphate. About 10% of kidney stones are composed of uric acid, a by-product of breakdown of meat, poultry and fish products, which is excreted in higher concentration in people with gout. Struvite stones occur in association with certain bacterial infections of the urine. Most kidney stones can be seen on a simple X-ray. Uric acid stones, however, are invisible to X-rays and require other investigations. 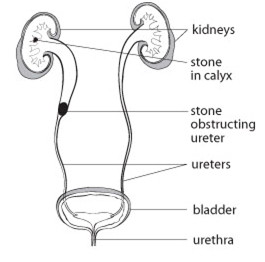 An ultrasound or a CT scan is often very useful in identifying the size and location of all types of kidney stones.A urogram is occasionally ordered and involves an intravenous injection of “dye” that is excreted in the urine, demonstrating the presence of a stone and the function of the kidneys while an x-ray is taken. Urine and blood tests will help in monitoring kidney function and determining the cause of kidney stone formation. The frequency of tests recommended depends on the severity of the stone disease, the number of stones formed in the past, and the person’s age at the time of first stone formation. Treatment of kidney stones is sometimes required for the relief of pain or obstruction. Many small stones will pass in the urine without specific treatment. Occasionally, shock waves are used to fragment a large stone into smaller particles that will pass more easily. A stone trapped in a ureter can often be removed with instruments introduced through the urethra (bladder outlet). More difficult stones may require surgical removal through a small incision. All of these treatments may not be available at your local hospital. The treatment recommended by us will depend on the specific circumstances of your stone problem. The mainstay of kidney stone prevention is a high fluid intake to maintain dilute urine. Although it is recommended that all stone formers should try to produce between two and three litres of urine per day, any increase in fluid intake is beneficial. Additional fluid should be consumed when fluid losses increase with heavy perspiration or diarrhea. Ideally, about half of your the daily fluid intake should be water. There is no clear evidence that hard water is worse than soft water in preventing kidney stones. Almost all fluids will be helpful in reducing the risk of stone formation. Some fluids such as iced tea, cocoa and cranberry juice may contain substances that are found in many kidney stones. These fluids are less helpful in stone prevention. Severe restriction of dietary calcium is not recommended for the prevention of kidney stones, and indeed, in some persons, it may even aggravate stone formation. Calcium restriction may also increase the risk of developing bone problems in older people. You should not reduce your dietary calcium without consulting with your doctor. An important constituent of many stones is oxalate. The body produces most of the oxalate in the urine as a by-product, while a portion is derived from one’s diet. Oxalate is found in high levels in spinach, rhubarb, cranberries, strawberries, blackberries, chocolate, nuts, beet greens, squash and cocoa and tea. Calcium oxalate stone formers should avoid consuming large amounts of these foods. A high intake of meat, fish and poultry increases the risk of stone formation. This applies particularly to uric acid stone formation, but also to calcium stone formers. Your animal protein consumption should be limited to 250 grams (eight ounces) daily. A high salt intake is associated with increased excretion of calcium in the urine, even though salt does not contain calcium. Salt restriction is recommended for stone formers. A high fibre diet may provide additional benefit. It is important that these dietary alterations become permanent lifestyle changes. These changes should be adopted gradually, starting with an increase in fluid intake and a reduction in dietary salt. Once this becomes a habit, additional dietary modifications can be introduced if stone formation continues to be a problem. Some kidney stone formers should be monitored regularly with an annual simple x-ray or ultrasound examination of the kidneys. Any dietary, medication and health changes can be reviewed at that time. More frequent follow-up may be required in recurrent stone formers, children and those with kidney problems.